Everyone needs a good chocolate chip cookie in their life and this is the one my family has totally fallen hook, line, and sinker for. It’s based on the chocolate chip cookie recipe that I found on pg. 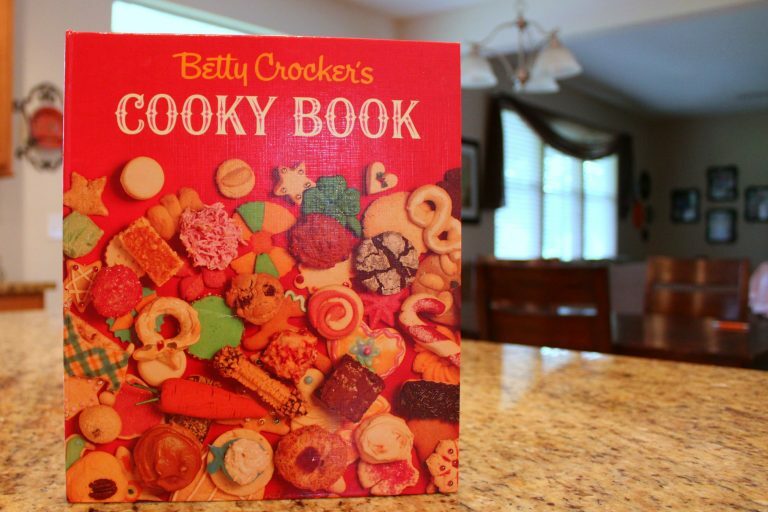 144 in the Betty Crocker Cooky Book. I have used a combination of butter and shortening (Crisco), adjusted the amount of flour and vanilla used, removed nuts, and added toffee chips. My mom had a version of this book when I was growing up and I loved to pour over it’s pages (kind of like Lucy, here) and look at the amazing cover. I thought it was out of print, but then a couple of years ago, Mom surprised my sisters and me with our very own brand new copies. Yay!! It’s super easy and you will pretty much always have the ingredients on hand (minus the toffee, but more on that later). 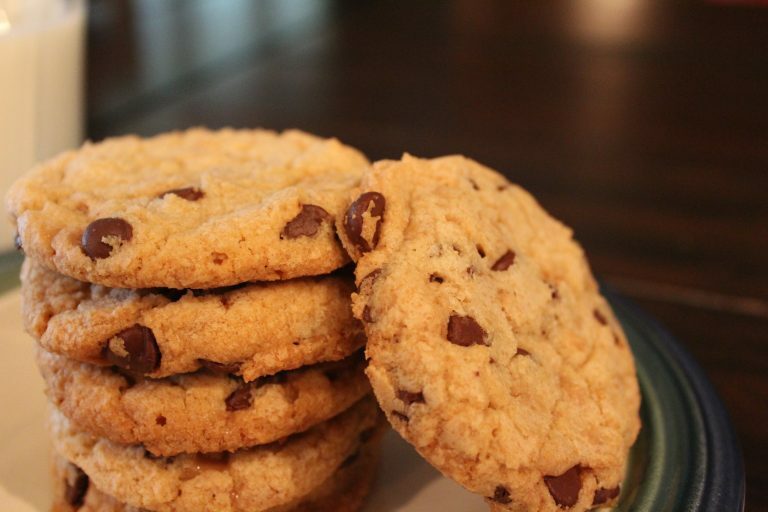 The cookies end up crunchy on the outside and chewy on the inside., just the way I like ’em. 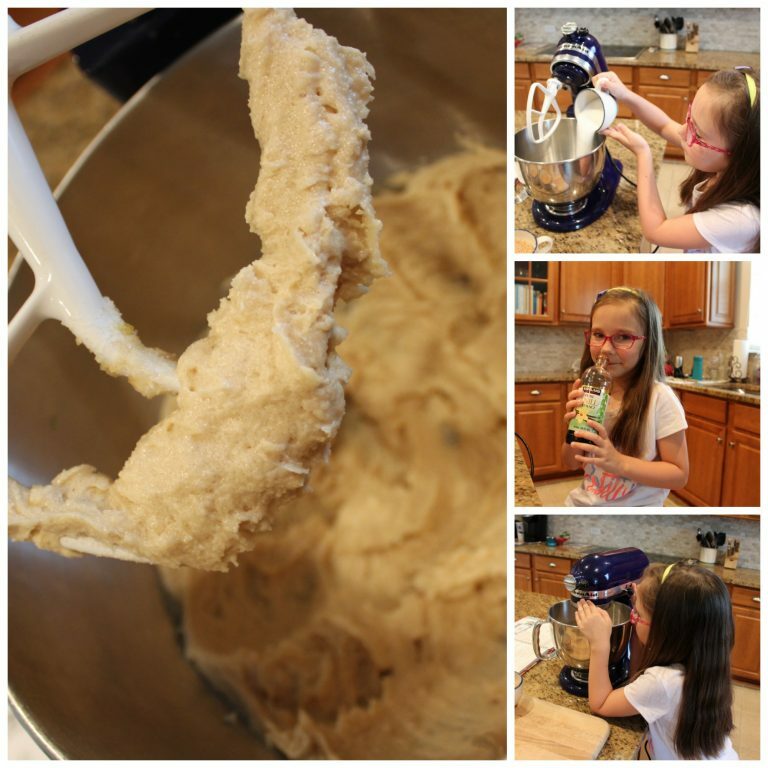 I get just about two dozen cookies out of a single recipe which is perfect for our family. Enough that everyone gets a few, but not so many that they sit around for days and days and then I eat way more than I should so that they don’t go to waste. 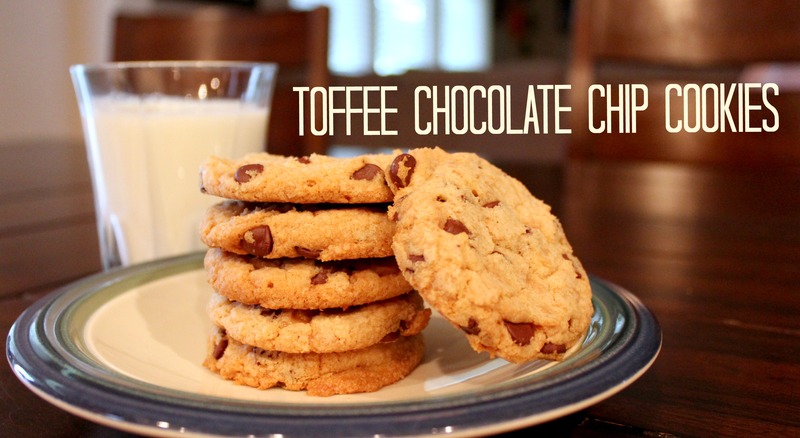 Everyone I’ve made them for thinks they’re delicious, so….bonus!! Yeah. You see what I did there? I had all of my ingredients artfully displayed and took about a million pictures until I got it the way I wanted it. Then, as we were making the cookies, I realized chocolate chip cookies don’t have baking powder in them! Oops. Also, this ingredient will change your baking world if you’ve never heard of them before. 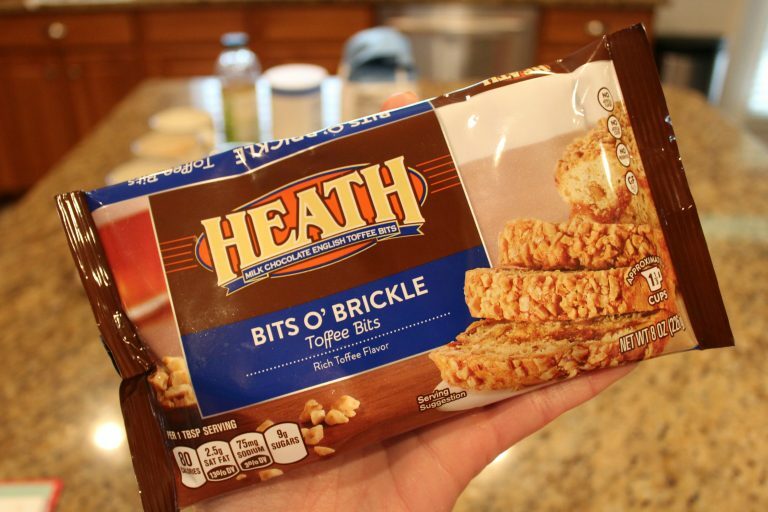 Bits o’ Brickle toffee is amazing!! 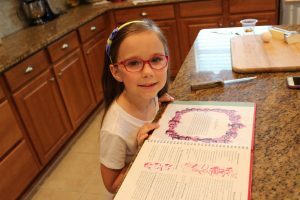 It really does help to have a super cute six year-old production assistant, so see what you can do about getting yourself one of those. Preheat oven to 375⁰. 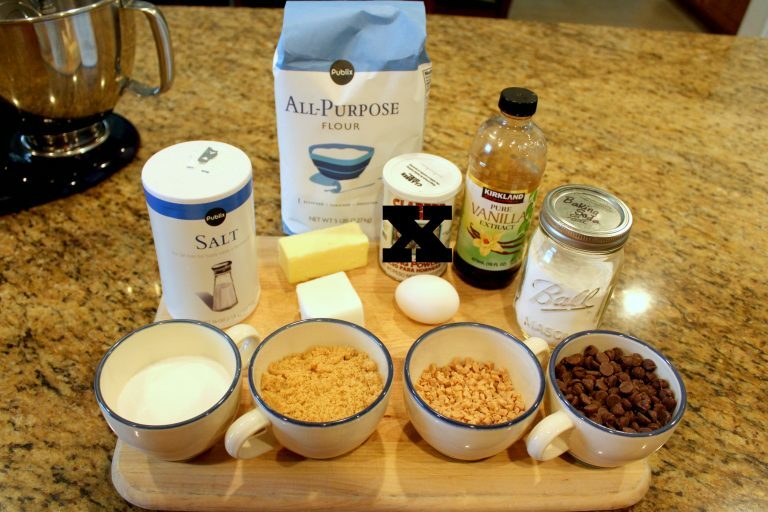 Mix shortening, butter, both sugars, egg, and vanilla. Beat for a couple minutes until the mixture is light and fluffy. Straight into the mixing bowl, measure the flour, soda, and salt. Mix to combine. 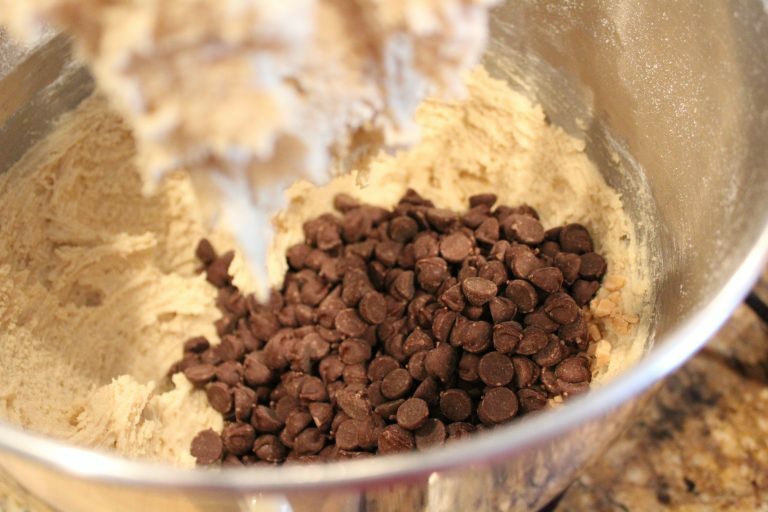 Pour in the toffee chips and the chocolate chips, then mix them in with a spatula or wooden spoon so the mixer doesn’t break them into a million pieces. Using a medium-sized making scoop or a rounded tablespoon, drop the dough onto ungreased baking sheets (these are my favorites), a couple inches apart. Bake for 14-16 minutes at 375⁰. 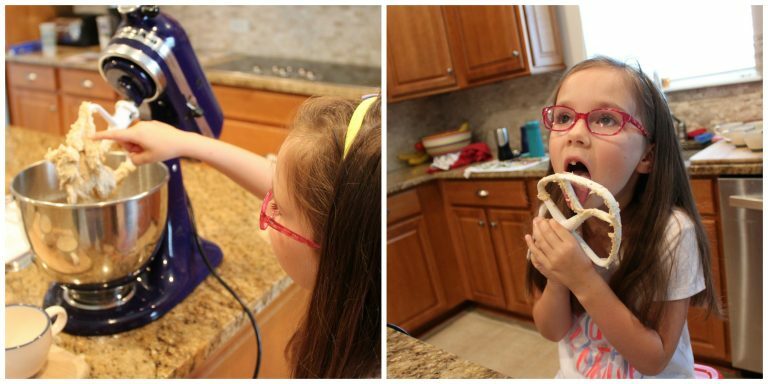 While cookies are baking, give your assistant a well-deserved snack break. 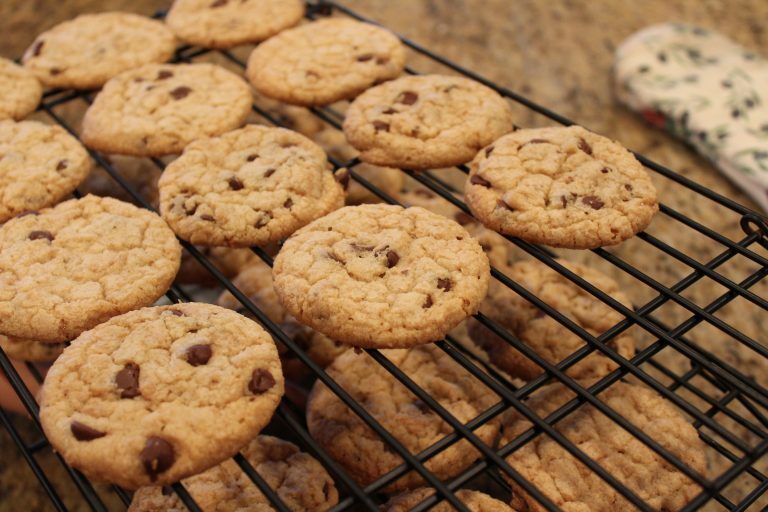 Cookies should still be slightly soft when you remove them from the oven. 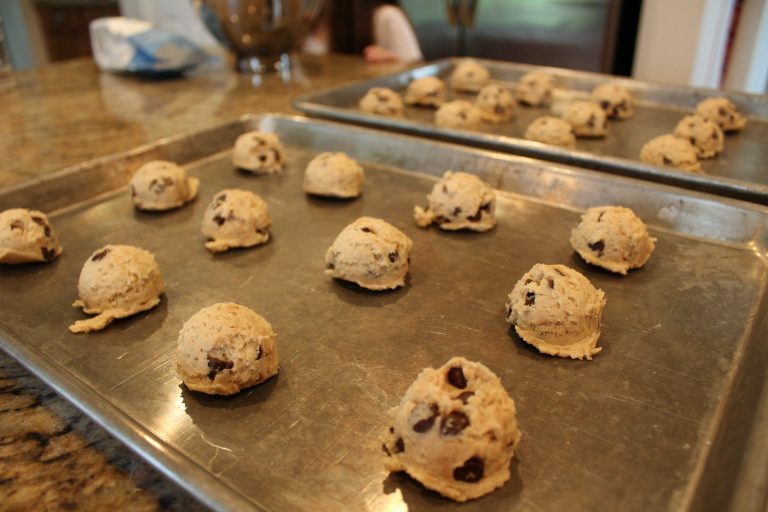 Let the cookies cool on the baking sheets for 2 minutes, then remove to a cooling rack to cool completely. Mmmmmm…. Look at that crackled, crispy top. And the chocolate specks. And the bits of toffee. And that golden brown color. Please, make these as soon as humanly possible and eat them while they’re warm and dipped in a glass of cold milk. You won’t be sorry.